Awuko Abrasives' ZT62X Floor Sanding Belts is one of the premium flooring products from Germany - now available in the UK! This is the most verastile abrasive belt we offer that can be used on any species of wood flooring and even for removing carpet adhesive or finishes. If you need a more aggressive abrasive grit for clearing tough finishes such as Aluminium Oxide finishes, we also make & convert in the UK, the Norton R976 Red-X Ceramic Belt (two notches up better than Norton Red Heat R955 and a tad improvement over the Noron Blaze R975). It has a friable Seeded Gel (SG) ceramic grain which allows aggression but leaves a very good finish on floors. Our flagship product, the 3M 784F Cubitron II Belts are the best and most versatile floor sanding belts hands down, which can push the life of on abrasive belt more than 450sqm (Irish Floor Sanding, Dublin)! It leaves the best scratch pattern on any belt due to patented self-sharpening Cubitron II grain. All are made with heavyweight cloth backing for extra rigidity on your flooring belt sander, allowing the abrasive to cut better on your floor and will get your job done a lot quicker! Great alternative against VSM ZK713X, VSM XK760X, SAIT Z-X, SAIT Z-H, Ersta Starcke 341X, Bona HD Belts, Hermes/Lagler Belts or Norton Red Heat / Norton Blaze floor sanding belts. For more information on our Floor Sanding Abrasives including all the Floor Sanding Discs, please visit our Floor Sanding Page. Lasts up to 2x as long as conventional ceramic belts (better alternative to Norton Red Heat R955, Bona Ceramic, Ersta Starcke Ceramic, and even Norton Blaze R975). Extremely low heat generation, producing lesser swirl marks on floors and leaves a better finish than ceramic belts or zirconia belts. Proprietary Cubitron II mineral blend provides consistent, faster results on any type of floor, including hardwood floors, aluminium oxide finishes, and even pine flooring, making it the best and most versatile floor sanding belt in the industry. Up to 2x faster than Zirconia Belts (on hardwood floors) and will last about 4x longer! 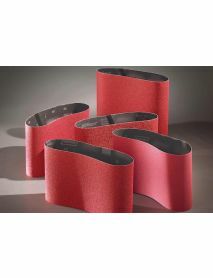 Semi-open coated grain construction reduces clogging compared to other ceramic belts! Far better performance and incomparable against VSM ZK713X, SAIT Z-X, SAIT Z-H, Ersta Starcke 341X, Bona HD Flooring Belts, Lagler Floor Sanding Belts. 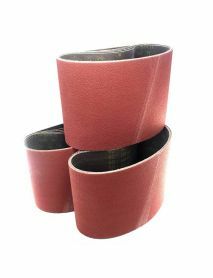 Better and more versatile sanding belt to Norton Red Heat or even the flagship Norton Blaze. Norton R976 Red-X is a couple of notches better than the Norton Red Heat (Norton R955) and equivalent to the orange Norton Blaze (Norton R975), and and is is a popular choice for floor sanding belt machines throughout Europe. It has high ceramic grit content for better longevity and higher cut rate on floors. Better alternative against VSM ZK713X, SAIT Z-X, SAIT Z-H, Ersta Starcke 341X, or Norton R817 floor sanding belts, up to 80% faster cutting rate compared to Aluminium Oxide!